The Great Debate provides students a premier resource for learning the art of debate and developing the skills they need to succeed in the debate round, in the classroom, and in the real world. Written in a conversational style with the debate student in mind, this book begins by discussing general debate principles and then offers specific insights into the numerous facets of both public forum debate and policy debate. Beginning with the basics and introducing more advanced topics, The Great Debate is an invaluable resource for debaters of all experience levels. 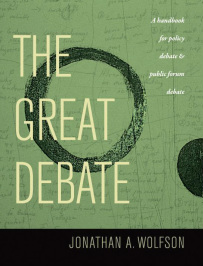 The Great Debate introduces public forum debate, a recent addition to the competitive debate landscape. Unlike many other debate styles, public forum debate does not require special debate vocabulary or knowledge of detailed theory from either participants or judges. Public forum debate focuses on developing debaters who can persuade any audience to support a particular position through a series of short back and forth speeches which mimic the real world debates on television between pundits and politicians. The Great Debate equips students to begin competing in this highly relevant debate format. The Great Debate also provides a foundation for students in policy debate. Policy debate requires debaters to extensively research and analyze a particular topic of public policy. Debaters generally propose that the government take a particular course of action or change a law. Students develop significant knowledge of a particular public policy topic and gain strong research skills. Policy debaters are comfortable prioritizing arguments to present in a short speech and learn to use cost-benefit-analysis to evaluate public policy options. The Great Debate gives students the tools to begin competing in competitive policy debate. The Great Debate was written by competitors for their fellow competitors. The handbook covers the basics of debate with special care to explain everything to those with no prior debate experience or knowledge. After a foundation is established, it then advances to intermediate theory and strategy debaters can use as they develop their skills. This book is perfect for your club, a beginning debate class, or as a reference resource for experienced debaters. For those interested in argumentation, The Great Debate offers an introduction to the basics of logic, fallacies, argument structure, techniques for replying to specific arguments, note-taking techniques, and research. These skills serve any student outside of the competitive debate context: in the classroom and in the real world. Equip yourself with the tools to make and respond to arguments, order a copy of The Great Debate. Public forum and Lincoln-Douglas debate training videos and accompanying outlines are available for free! Click above or click here to view our free YouTube videos and be sure to request your complementary debate training curriculum too.